Here’s the official description of Occupy Wall Street from their website: WE’RE MAD…AND RALLYING…AND WAVING OUR FISTS…RRAAAAAARRRRR. Okay, so that’s not really the description. The real description mentions “employing the revolutionary Arab Spring tactic.” Bad news American protesters: the real Arab Spring protesters whom you are trying to emulate are in a slightly (yes, I’ve designated Comic Sans as my sarcasm font) worse situation than you. Yes, it stinks that you can’t find a job that pays $10/hour with benefits. Do you know what the average yearly salary is in Libya? $1,785. Do you think they get unemployment pay when they lose a job? Yes, I get it. You’re mad. Not Libyan mad…but mad none-the-less. Truth be told, I’m pretty mad too. My day job is ridiculously stressful due to large-scale fiscal bafoonery. What’s your solution? What are you going to do to fix the problem? WE’RE GOING TO BE MAD…AND RALLY…AND WAVE OUR FISTS…AND RRAAAAAARRRRR TOGETHER. No offense, but I think your plan is flawed. 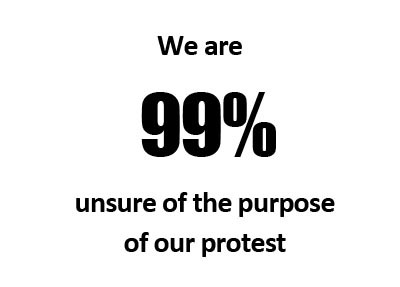 Also, you’re not the 99%. That’s stupid. This is America. For better or worse, you’re part of the 100%. Let’s look at a couple things about which you’re RRAAAAAAARRRRR-ing. 1. From the Occupy facebook page: “They have held students hostage with tens of thousands of dollars of debt on education, which is itself a human right.” Wow. Just wow. Now, this might just be crazy talk…but, what if those of you protesters who are “held hostage” by student loan debt (which you chose to acquire in order to attend a school that 99% of humanity has not had the opportunity to attend) would start working and stop occupying things? You might not be held hostage any more. Also, fyi…as of 2010 the government pretty much controls the student loan industry. 2. Jobs: I get it. Jobs are scarce. Let’s look at 1 of the largest job creators of our era: Walmart, currently employing ~2.1 million people. How did Walmart create all those jobs? Well, ol’ Sam Walton traveled around to a bunch of big grocery stores, stood in front of each one of them, held a clever hand-made picket sign, and shouted obscenity-laced, moderately coherent rants about unfair pay and corporate greed. What? That’s not how Walmart started? I guess I should read his biography. Fact: 2.1 million jobs exist today because Sam Walton worked his tail off to create a better shopping experience rather than “occupying” flawed stores. Fact: millions more jobs would exist today if more people stopped whining about what they don’t have and started doing the most with the 1st world opportunities they do have. You might be thinking “What do you know, Josh Wood? You have a job.” Well, I’ve been there. I’ve been a victim of a bad economy and my own stupidity. I’ll share my story tomorrow. Oh, and one last little note: I’ve noticed from protest photos that a large number of protesters are owners of products created by Steve Jobs. I’ve over-generalized you and am guessing that you revere this guy as a hero. Do you know what Steve Jobs did when fired and wronged by a big bad company? He worked his tail off and created Pixar. Think of how different the world would be if Steve Jobs had spent his mandatory leave of absence creating picket signs rather than working to create something amazing. Many of you might not be reading this right now. Wouldn’t that make you sad?